Danish Hat-trick for RML Chevrolet. The RML designed and developed 2006 Chevrolet Lacetti used by Chevrolet Motorsport Denmark (CMD) took a spectacular hat-trick of victories in the Danish Touring Car Championship last weekend. As well as the three amazing wins, the Perfection Racing-run team made the weekend at the Padborg Park circuit absolutely flawless by leading the times in practice, qualifying, and super pole. Drivers Pontus Mörth and Henrik Lundgaard both tasted the victory champagne, with Pontus reaching the top step of the podium in the first and third and Henrik in the second. 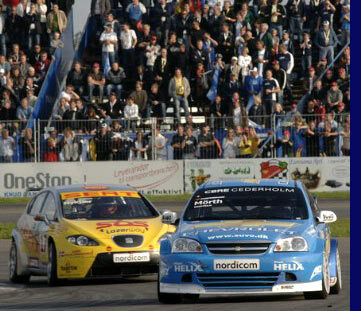 Henrik had won a previous round at the Jyllands Ring, whilst it was Pontus’ first-ever victories for the team. As well as chassis for both drivers, RML provides a full engine support programme to CMD throughout the course of the season. Chevrolet Motorsport Denmark is now second in the team championship behind Team Essex with 360 points, whilst Henrik and Pontus sit sixth and seventh in the drivers championship with 184 and 176 points respectively. +44 0(1933) 440240, or email dans@rmlmallock.co.uk. The RML Group comprises six divisions; Motorsport, Automotive, Engines, Historic, X-Pro and Events. Based in Northamptonshire, England the company's 4,300 square metre facility includes full design, development, manufacturing and operational support for automotive engineering projects.